If you are among those individuals who understand the value of their costly television sets, then the glass TV stands are something that you should look out for. The glass TV stands not only enhance the look of your room but also protect your TV from any kind of damage. These stands are durable and the tempered glass that they use assures you about durability. 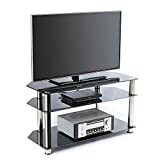 Undoubtedly, glass TV stands provide a firm base for your valuable TV set and also add a special look to your interior. Furthermore, the TV stands offer ample space to store your DVD player and other valuables. So, you can be sure of about the complete safety of your TV. However, there are several TV stands available in the market from different brands. So, it becomes a headache to choose the suitable TV stand for the corner. One must be sure about the durability as well as the quality of the product before buying it. Well, do not worry. Have a look at our top clear glass TV stands and chooses the right one for yourself. The Fitueyes Classic Clear Tempered Glass TV stand can be easily assembled without the need for complicated tools. 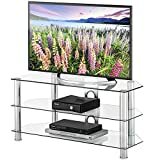 This three-tier glass stand with the classy aluminium poles looks very elegant and sturdy enough to easily support a 50-inches LCD, LED or OLED TV. You can use the extra space in the middle and lower layer for accessories like a Blu-ray player. Sometimes bad cable management can make bring down the appeal of your expensive television. The big holes punched through the rear aluminium frame are great for cable management and gives it an overall clean look. If you have a small bedroom or just wish to save some more space in your living room, then the Walker Edison 44” Glass Corner TV Stand is the perfect fit for you. The triangular corner design has metal tube frames with a powder coat finish which are durable and can support flat-panel TVs up to 48-inches. Also, the cable-management system renders a neat appearance. Install it in just 30 minutes or less and it will be ready to be used. AVF is a market leader when it comes to TV mounts and has been a remarkable name in the field. This AVF stand just tells another story of their brand’s innovation. The black coloured tempered glass and silver metal tubes have a design that just blends or compliments most room decors. AVF knows that the placement of the stand in rooms is a concern for you. To solve that, they have designed it with angled corners so that you can place it in most rooms including the corners. The open shelf design facilitates smooth ventilation which further prevents from overheating. This TV stand really makes you feel like a king with its ergonomic design that would be envied by royalty. The semicircular-shaped metal frame with chrome finish and black finished glass top just accentuate the elegance of the room. It doesn’t matter if you are new to furniture assembling, even an amateur can get this assembled and set up in less than half an hour. It further has a chrome finish, functional shelves and the angled legs provide great support. In short, it is a stylish pick. RFIVER has made a stand which screams functionality along with design. The three shelves are made of tempered glass that has immense weight capacity. 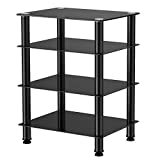 The top shelf can support those gorgeous plasma screens up to 46-inches and the lower shelves with 33 pounds capacity can easily house your DVD or Blu-ray players. 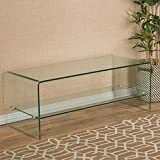 This corner glass TV stand has an angled back and so, you can just place it in the corner or keep it against the wall. Without wasting much time, make this modern and practical TV a part of your home. Glass shaped just right can redefine elegance and it seems that Classon has done that perfectly. The upper shelf just extends and rounds off to meet the floor 15-inches below. If you are doubting on its weight capacity, well it can easily support most large flat screen TVs so you can rest easy about the big 40-inches TV that would be the main attraction of your living room. You don’t need to worry about the durability of the stand either since it is made of tempered glass. A shelf for storage makes it way more attractive. Another great product from the AVF family of products that looks premium and is sturdy enough to support large LED, LCD, OLED or plasma TVs, this three-tier stand will blow your mind. The top shelf supports flat-panel TVs up to 60-inches and the lower shelves can house most of your A/V accessories and DVD players you have. Absolutely easy to assemble, you can just place it against the wall or at any desired corner because of the angled back. Being made of black coloured tempered glass and chrome legs, you can already imagine its longevity. AVF guarantees quality as well as supreme safety. The Fitueyes stand definitely seems a lot beneficial and has a sleek look that would sit great in any room. 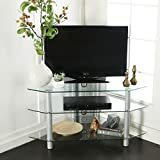 The top shelf can support up to 110 pounds, so a moderately big TV for your play station or XBOX can sit easily for a friendly FIFA match among friends. The black coloured tempered glass shelves look great and can easily house your accessories and components that you need for your TV or console. You just need to spend 30 minutes of your precious time and your glass TV stand with self will be ready for use. It has a strong steel frame that is further coated with powder. The number of times AVF has come up in this list, it’s no surprise that it is a strong market leader when it comes to TV stands. So let’s focus on the features that set this product apart from the rest. TVs or big electronics tend to overheat when used for a continuous period of time. But to reduce your concerns AVF came up with a design that has ample ventilation and minimizes overheating because of the open shelf design. The metal legs of silver colour when combined with black tempered glass, a beautiful glass TV stand is made. 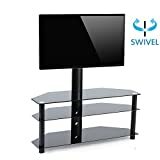 It does not matter if you have a huge or small TV, this stand has a central metal frame on which TVs from 32 to 65-inches can be easily mounted. Thus, this is the glass TV stand with the mount in our list. Moreover, the mount bracket can swivel up to 45 degrees which gives you a wide range of viewing angles, unlike most stands. Has a thick tempered glass, the height adjustment feature makes it exclusive. Hence, it is safe and has supreme quality. Also, it is multifunctional and comes with hassle-free cable management. Overall, it is a great product which leaves an extremely small room for regret. Glass TV stands have become a mandatory inclusion in every household. It adds glamour to your interior and makes storage of your TV as well as its accessories easy. Scrutinize every requirement and the desirable glass TV stand will be yours.